Pieter Anthonisz van Groenewegen (ca.1600- c.1658). Landscape painter. He was influenced by his sojourn in Italy, having joined the 'Bentveughel' circle there under the sobriquet "Lion" in the 1620's, joining Bramer and Breenbergh there. Seen as follower of Breenbergh and Jacob Pynas. Spent time in The Hague and Delft. Entered Delft Guild in 1626. Groenewegen was a wealthy burgher. In 1633 he lived in Het Gouden Hoofd (The Golden Head) on Voldersgracht number 1 (a building since replaced by the monumental Vleeshal / Korenbeurs building) just behind the Fish Market. He rented The Golden Head for 230 guilders a year. It may have been large enough to house an extended family including his father who was an attorney. 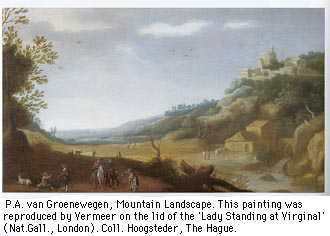 His works appear frequently in Delft inventories; Vermeer's father Reynier Vos / Vermeer dealt in his paintings. 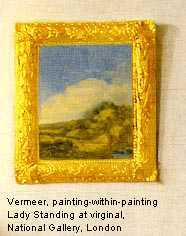 For a full story of how his paintings appears within two Vermeer paintings The Hoogsteder Journal nr 7, 2000. Note. GAD Beydals collection. Thieme-B. 1922, XV, p. 67. Obreen III p. 305. Death year confirmed. Years of birth and death in De Stad Delft 1981, II, p. 202 and in All the paintings of the Rijksmuseum p.247 given as 1600-1657; corrected in Delftse Meesters p. 34 as "active 1623 1657". Gouden Hoofd was next to Suyckerhuis. GAD Date 28 December 1633 (GAD, NA 1857), for 230 Fl. pounds a year; private communication by Montias, 2000. Montias 1982, p. 125-126, 330, app. Table A2. In the north Netherlands the word Pound Flemish was often used as equal to the guilder, not in the 6:1 ratio of Pound Flemish to the guilder (private communication M.J. Bok, 2000). Thus the entry in exh.cat. 'Vermeer and the Delft School', Metropolitan Museum of Art, New York City, 2001, p. 85 is probably incorrect. Note. E. Buysen, Haagse schilders in de Gouden Eeuw, Hoogsteder The Hague / Waanders Zwolle, 1998, p. 309-310.